This evening event at the site of the plane will feature a discussion hosted by Emirati photographer Ammar Al Attar. Emiratis will come together to explore the meaning of UAE identity and the state of Emirati cultural traditions, past and present. 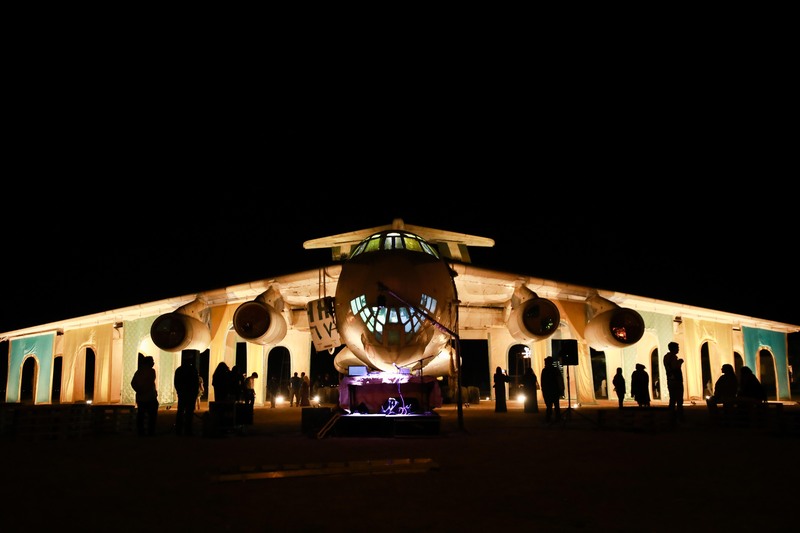 As part of the Sharjah Biennial 14 exhibition Look for Me All Around You, curated by Claire Tancons, the artist collective New Orleans Airlift has produced a public art project called The Trans-National (2019), built around the site of an abandoned plane in Umm Al Quwain. The project explores notions of community, cultural and national identity, nation building and home in the UAE. This evening event at the site of the plane will feature a discussion hosted by Emirati photographer Ammar Al Attar. Emiratis will come together to explore the meaning of UAE identity and the state of Emirati cultural traditions, past and present. Photographs from personal and family archives will be digitally projected onto the plane. Please note that the talk will be in Arabic only. Transportation from Information Center, Al Mureijah Square to the plane site in Umm Al Quwain and back will be provided. The shuttle will depart Al Mureijah Square at 6:00 pm. For a location map to the plane, please click here.